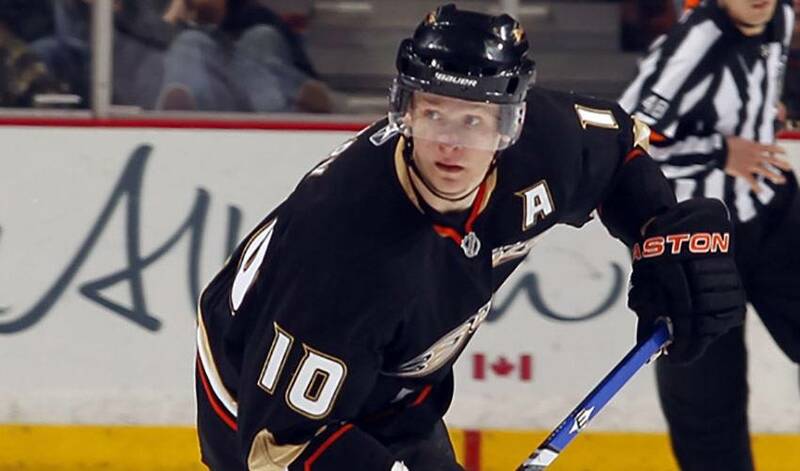 On or off the ice, Corey Perry has certainly been in the driver's seat in 2010. Missing out on the playoffs would translate into an unfulfilling campaign for most athletes. But that was by no means the case for Perry, a player who had plenty of highs throughout a memorable 102-game season in 2009-10, despite seeing no post-season action. The Anaheim forward's busy campaign comprised six preseason, 82 regular season, seven Olympic and seven World Championship games. But it wasn't just a gold medal with Team Canada at the 2010 Winter Games that had Perry smiling. An invitation to Hall of Fame legend Wayne Gretzky's annual golf tournament saw the 25-yeard-old get the keys to a new car after he carded the best score in the celebrity division of the event. And for those who know him well, including Jim McKellar, Assistant General Manager and Director of Public Relations with the Ontario Hockey League's London Knights, couldn't be happier for Perry. Perry jumped to 78 points in 2002-03 and was selected 28th overall in the 2003 NHL Entry Draft by the Anaheim Ducks. In his fourth and final turn with the Knights in 2004–05, Perry scored a personal junior career-best 130 points in 60 games. He went on to record 38 points in the post-season to help London capture the J. Ross Robertson Cup as OHL champions, en route to a Memorial Cup championship. Perry made his NHL debut in 2005–06, but was sent to the American Hockey League (AHL) early in the year, along with fellow rookie and future linemate Ryan Getzlaf. The duo clicked immediately and the results were impressive. Perry and Getzlaf teamed for 67 points in 36 games with the Portland Pirates and were subsequently called back to the Ducks. Perry finished his first big-league campaign with 25 points in 56 games with Anaheim. In 2006–07, he had 44 points in 82 games, playing with Getzlaf and Dustin Penner on a combination dubbed the "Kid Line". Perry capped the year with a Stanley Cup championship with the Ducks, netting 15 points in 21 games. The following season, Perry increased his totals to 29 goals and 54 points and was named to his first NHL All-Star Game as an injury replacement, along with Ducks' teammate Scott Niedermayer, Chris Pronger and Getzlaf on the Western Conference side. On July 1, 2008, Perry signed a five-year contract extension with the Ducks. The 2008–09 proved to be a memorable one for the right winger. He led Anaheim with 32 goals, and finished second on the club with 72 points. He contributed eight goals and six assists during the 2009 Stanley Cup Playoffs. In 2009–10, Perry went on a 19-game point streak until it was snapped on December 4, against the Dallas Stars. He finished the year with 76 points, including 27 goals. Perry was also part of the Team Canada entry that struck gold at the 2010 Winter Olympics in Vancouver. In Team Canada's first game of the tournament, he helped lead Team Canada to an 8-0 triumph over Norway with one goal. He also scored twice in a 7-3 win over Russia in the quarterfinals. In the gold medal game, Perry netted the second goal against the United States to make the score 2-0 in the second period, as Canada went on to win 3-2 in overtime. A rewarding season on many levels for Perry, but also a draining one. Not that he's complaining. In fact, you get a sense Perry will be ready to roll once training camp starts. And something that doesn't come as a shock to McKellar.